Located in Dubai Mall – one of the most visited urban centres in the world, attracting over 80 million visitors every year since 2014 – the new Apple Dubai Mall occupies the most pivotal position in the city, alongside the iconic Burj Khalifa and overlooking the famous Dubai Fountains. 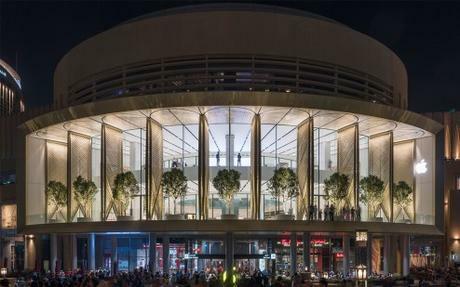 Spanning over two floors, it embraces the theater of the fountains with a sweeping 186-foot (56.6 metre) wide and 18-foot (5.5 metre) deep terrace – a first for any Apple Store – with unparalleled views of the spectacular setting and the incredible choreographed display. Made entirely of lightweight carbon fibre, each wing has multiple layers of tubes forming a dense net. Following an in-depth study of sun angles, the rods have been distributed in higher concentration where the solar radiation is the most intense over the year. The unique pattern allows clear views out for people standing on both levels of the store, and the sunlight streaming through the wings casts dappled shadows deep into the interior. “The opening and closing of these majestic Solar Wings is analogous to a delicate ballet recital – but on a monumental scale. In some ways it is a very spiritual experience, with the sun streaming through them and creating the most delicate and beautiful patterns of light and shade – a seamless blend of technology and culture.” Behling added. Access to the store is through full height, glazed pivoting doors on both levels, directly from Dubai Mall. The Avenue, a specially designed area for accessories display, on the lower level along with Apple’s signature display tables sits in the midst of a grove of trees, creating a calm environment to experience Apple’s latest products. Apple Dubai Mall will also launch Apple’s new global in-store experience, ‘Today at Apple’ – where New Creative Pros, the liberal arts counterpart of Apple’s technical Geniuses, will offer individual advice and training on photography, filmmaking, art and design and more. The new shaded terrace features nine substantial trees within large planters incorporating seating for visitors to sit, relax and enjoy the view. The planters will rotate mechanically to ensure that the trees receive even sunlight. The terrace will offer the communities of Dubai a new vantage point – furthering Apple’s commitment to the communities they are part of. Apple Dubai Mall With One of the Largest Kinetic Art Installations in the World Opens to Visitors originally appeared on Design & Lifestyle Blog on 11 May ’17.